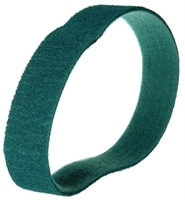 Applications: Surface conditioning belts will perform a number of useful metal finishing tasks. The coarse grade will remove rust and coatings, whilst the medium and very fine grades will remove light rusting to tarnishing to leave a bright finish. They will blend ground off welds and burrs. Parallel brushed (coarse) or satin (very fine) finishes can be achieved on metal such as stainless steel or aluminium. Product Notes: Surface conditioning material uses a non-woven abrasive fleece, needled to a low-stretch backing to give sanding surface that will give consistent performance and finish throughout its life. Although we just list a small number of options for illustration, we can make most sizes to order. Please contact us for a quote. Due to the higher cost of surface conditioing compared to coated abrasive it is worth considering keeping the specified width to the minimum required.